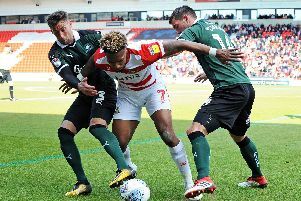 Doncaster Rovers had to settle for a point against play-off hopefuls Rochdale. Kyle Bennett put Rovers ahead in the first half with a controlled finish from inside the area. But Rochdale fought back after the interval and grabbed a share of the spoils when Ian Henderson turned in Michael Rose’s cross. Rovers were much the better team in the first half but were jittery at the back and sloppy in possession in the second period. An unmarked Henderson headed the first chance of the game wide for the visitors from Rose’s pinpoint cross. Despite the visitors making the brighter start, Rovers took the lead on 17 minutes when Bennett swept home Wabara’s right wing cross with a controlled finish. The visitors appealed for offside but after a lengthy consultation between referee Gavin Ward and his linesman, who had flagged, the goal was given. Rochdale responded well to going behind and Bywater produced a brilliant save low down to keep out Rose’s powerful drive. From another excellent Bywater save, this time from Allen, Henderson then slammed home the rebound but his effort was ruled out for offside. Tyson went close with a volley from the angle of the box and McCombe’s bicycle kick dropped just wide during a good little spell for Rovers, before Bennett fired just wide on the stroke of half time. Rochdale probed after the restart and were back on level terms just before the half hour mark when some slack marking allowed Henderson to flick home Rose’s left wing cross. Henderson should have put Dale ahead shortly after when he broke clear but his attempted lob was easily gathered by Bywater. The momentum of the game had swung completely and substitute Calvin Andrew, with his first touch, then forced Bywater into another save with a header. From a corner Vincenti turned a close range effort onto the post, before Bywater did just enough to keep out Rhys Bennett’s header. Dale threw bodies and high balls forward in search of a winner but they had to make do with a point. Rovers (4-4-2): Bywater, Wabara, McCombe, Butler, Stevens, Coppinger, Furman (Forrester 73), Wellens, Bennett, Main (Clarke-Harris 67), Tyson (Mandeville 80). Subs: Marosi, Jones, Evina, Middleton. Rochdale (4-5-1): Jones, Cannon, Eastham, Kennedy, Rafferty (Camps 53), Rose, Bennett, Allen, Logan (Andrew 67), Vincenti, Henderson.